If you could only have 5 healing crystals in your toolbox, which would you choose? 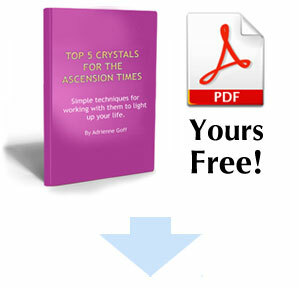 In this wonderful, free download, I give you my top crystal picks for moving your energy into the highest space possible. I feature my five favorite crystals for the ascension times, along with beautiful photos, a summary of their metaphysical properties, and unique crystal healing techniques that I have designed to help you apply their powers for your highest good. How to create a Violet Flame cleansing bath. How to download your Divine Feminine aspect. How to send love and healing in a relationship that is struggling. How to manifest something wonderful. How to heal your etheric blueprint of past traumas. BONUS: Simple Ascension Layout for the chakras, which includes all five crystals working together synergistically to open, clear, and activate your entire energetic system. To receive this free download, just enter your email to the right.